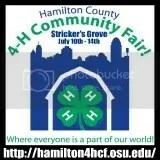 You are currently browsing the daily archive for June 10, 2008. I kinda slacked off after my last big post. But with very good reason folks. P turned the Big Two on Friday. There was much celebrating. I’m not sure why we make such a fuss over the Big One – she was barely awake for much of that birthday. But TWO – TWO was wild. And so much fun. All that came to a screeching halt bright and early Monday morning as I watched The Today Show and was introduced to the Potty Whisperer. She claims she has potty trained (in one day no less) as young as eighteen months. What the heck have I been doing the last six months people? Oh, that’s right blogging with you people. Her booty camp caters to 2.5 year olds, so on that note I have a little time. But it has me thinking. I’m terrified of this next phase. I have little to no real motivation to get started and that coupled with no idea where to start leaves me uninspired and buying Pampers for the next forever. I don’t know what the hesitation is – I’ve eagerly anticipated all the other monumental points in her development. The eating, the rolling, the crawling, the walking, the talking. But this, not so much. I think I find it a bit yucky. And as yucky as a diaper full of poo is, the thought of accidents in the car or at the mall with said poo when I’m left unprepared is far more intimidating. And then I hear about this kinda thing – the naked pooper? I’m running for the hills looking for Mary Poopins. Then again, maybe this is the last big girl frontier and I’m clinging to that baby for dear life. I share as other Moms tell of their experience with the ever-growing independence of their children. The last two years have been miraculous in her development, but I’ve not moved much from the weeping mom who gave birth in the wee small hours of the morning back in June 2006. I look at P and still see the eight-pounder we brought home from the hospital. Nevermind that she is pushing thirty pounds now. So not only is it yucky, it’s also a little sad. Yes, I know I have to potty-train my kid. Don’t start looking up the number to child protective services just yet. But can you tell me how to do it? And by that I mean can I drop P off to you tomorrow afternoon and pick her up when she is ready? Great, thanks. PS – A couple shout-outs from the birthday fun. Check out the amazing bakegoods we celebrated with! My friend Andrea did “pupcakes” for P’s preschool class and Busken’s, our local bakery made this incredible zoo cake for her party later that weekend. We celebrated at the Cincinnati Zoo and I highly recommend their Birthday Treehouse! 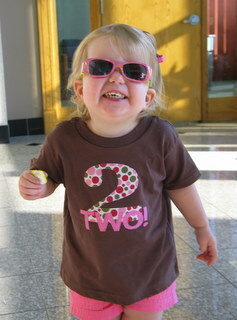 P had “two” shirts (seen above) for her big days from the wonderful Sew Sara at Etsy.